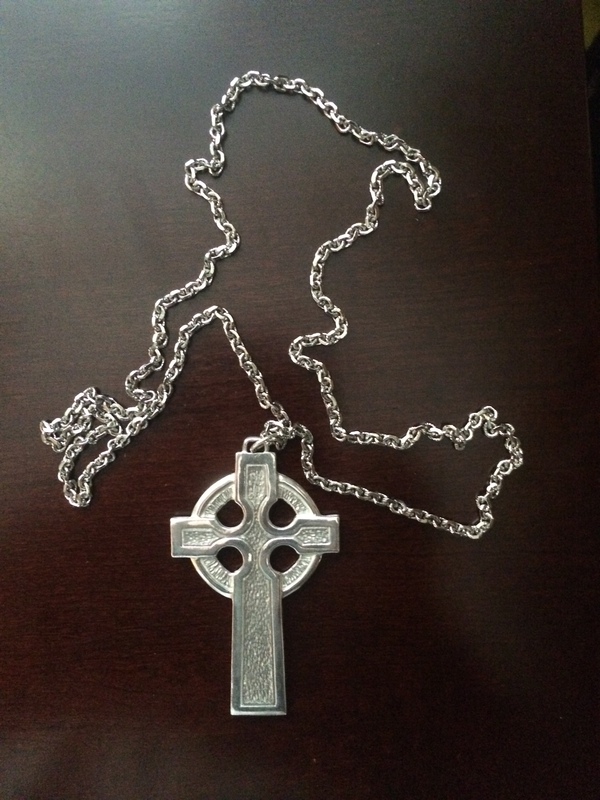 A number of people have been asking me about the cross I have been wearing in worship and at weddings, and my response has been, “It’s a long story.” I finally decided to put the story and explanation here so folks can understand it, and what it means to me. There are a couple of starting points to the cross. One is August 1, 1995, when I started work as the Pastor of First Presbyterian Church, Pascagoula, MS. I decided that I would wear a large cross over my robe (or suit, if I was not robed) whenever I was involved in worship. I bought one, and used it for a few years, before purchasing a larger one, and wearing it for the remainder of my ministry there. When we moved back to Atlanta and I returned to the Peachtree staff, for whatever reason, I did not wear the cross. The more time passed, the less I thought about it, and it sat in a box in my office. The other starting point is July 24, 1945. Yes, that’s the correct date; it is the date that my parents were married, six weeks after Dad returned from ten months as a prisoner of the Germans (after being shot in France). Mom and Dad were engaged when he went overseas, and after his liberation Mom kicked plans into action. Like with many couples, they received a good bit of silver as wedding presents. Among those were some silver candlesticks. Then in February, 1983, Mom and Dad’s home was broken into. The thieves got candlesticks, flatware, and some of Mom’s jewelry. Most all of it was retrieved by the Police, but there were two candlesticks that were in the process of being beaten down and broken up for melting and sale when the thieves were apprehended. Mom never had them repaired, but kept them in a pacific cloth sack. In the summer of 2003, Dad died suddenly and unexpectedly, and Mom followed him ten weeks later. “She didn’t die of a broken heart,” their Pastor said, “She died of a full heart.” In the sifting, sorting, and selecting of their property, I chose to take the mangled candlesticks; I thought that one day I would have them made into a cross to wear. So some time after we returned to Atlanta and Peachtree, I took them to H.G. Robertson Fine Silver, and talked with them about my idea. They said that they could do it, but that more silver would be needed. I was encouraged to browse flea markets and estate sales, looking for odd pieces of flatware. Flea markets and estate sales and I don’t see one another much. I left the candlesticks with them, and returned every so often (like every couple of years?) to talk with them about it. The shop even moved, but they kept track of them! “Look into silver” remained on my weekend to-do list for many years. We got back to “party central” after the rehearsal, and at some point, someone told me that Glenn wanted me in the house. Lib and I walked in, and Glenn was standing there with Kelly, grinning from ear to ear, holding a white gift sack. As we approached, Glenn’s sister Laura and her boyfriend Grey Campbell started to walk away. Glenn stopped them, saying, “You guys had a role in this.” He handed me the bag. I took it, thanked him, and lifted the tissue paper from the opening. I looked in, and realized what was in it. I said, “Oh, my word.” I recognized the black box that the cross I’d worn in Mississippi was stored in, and next to it was a white HG Robertson box. I replied, “Not only tomorrow, but from here on out, every Sunday.” And so I have—on Sundays, at weddings, and memorial services, and any other service. And Glenn—incredible guy, generous soul, great friend that he is—said, “I want to finish that for him.” And so he did. Shortly before his wedding, I handed it to Glenn, and asked him to place the cross on me. That was the first time it was used, but it’s been used frequently since then. And I intend it to be used for many years, and on many occasions, to come. And that is the cross that I wear on Sundays. It is a reminder of my parents, a testimony to redemptive grace following tragedy, and the presence of good friends with me. It’s a gift that spans close to 70 years, and is quite likely the greatest gift I have ever received. Day Two dawned cloudy, just the way we like it. When you are two degrees south of the Equator, that puts you closer to the sun, so it’s really nice when you are working outside, and doing manual labor, to have some nice cloud cover. Someone commented when we reached the Hogar facilities how nice the clouds were, and I immediately “shushed” him, not wanting us to be cursed. Moments later, the sun came out—but mercifully only for a short time, and the clouds came back for the better part of the day. We broke up into two teams today, in order to build two homes. Team Ivan (both teams named for the “maestros,” or master carpenters that we work with) is comprised of Chris Southerland, Ed Easterlin, Bill Schaeffer, Reid Barker, Joe Ellis, and Scott MacKenzie. This team had an interesting day, dare I say a “barakah” day. Barakah is a Hebrew word that mean, depending on the context, either blessing or curse. Their curse was that the auger they were using sheared a pin after digging three of their (nine) holes, making the rest to be completed using post hole diggers. Repairs were attempted, and tomorrow will be an interesting day as spare parts are cobbled from old augers and some bolts we brought with us. 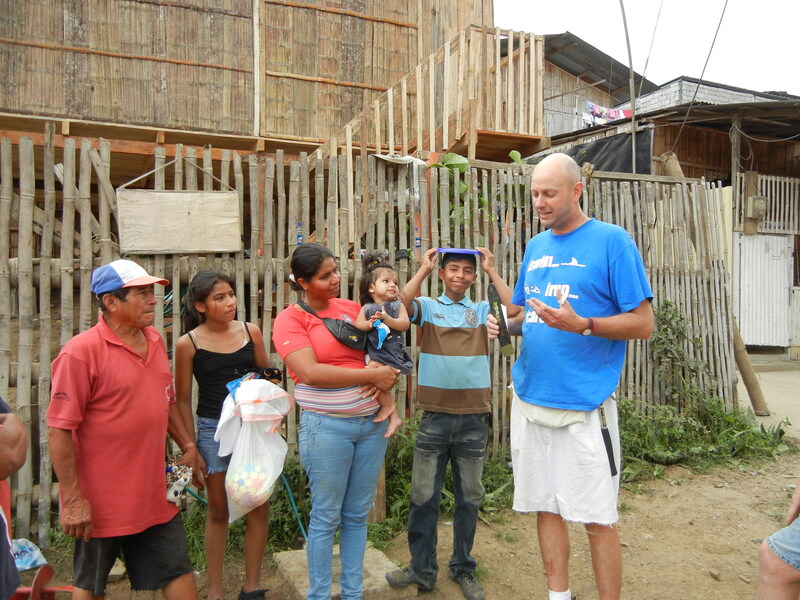 The blessing was the family they built for: Fabian and Asuena, and their eight children, all between the ages of one and thirteen. The family was a very grateful clan, cheerful through the day, helpful on the build and when things went wrong, as well (the auger). This was no doubt shown best when, after the presentation of the Ascension window to the family, all of the children presented each of the guys with a handwritten Thank-you note. This family, supported by Fabian selling drinks on the streets from the cart on the front of an old bicycle, was perhaps more appreciative of any family we have ever been privileged to serve. Team Gato (Robert Owen, Marty Klein, Jim Beddingfield, Chris Hamilton, Bill Boone, and Chuck Roberts) built for another “nuclear” family, but not one as large. 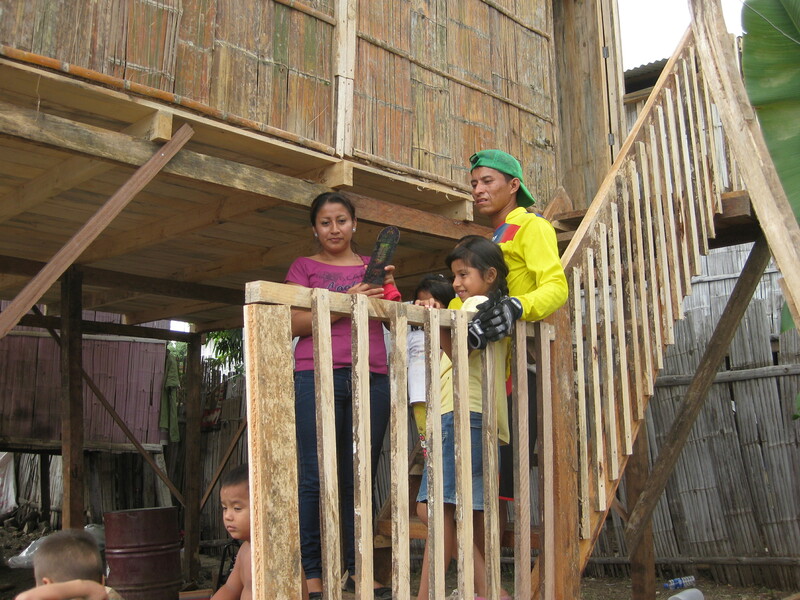 Jose and Narcissa have three children, and Jose—when he has work, is a laborer, hauling pipes to build sites and other projects. In a good week, which is not often, he can clear $85. Similarly, this family was cheerful, helpful, and very kind. Think about what a blessing that is to this little girl, to look forward to sleeping in a room with a window—something that so many of us take for granted, so much so that we do not even pause to look out the windows of our homes to see the world God has given us to care for. Tonight at dinner, we reflected on the verse “Of those to whom much has been given, much is expected,” and realized that while we came here to build homes, we also came to invest in lives—the lives of the families we are privileged to serve . . . and that it is in giving of ourselves, that God gives us more to give back. By the time my family and I moved to Pascagoula in 1995, Bessie Ham was homebound. A legend to several generations in the community, Bessie taught English at “PJ” (Pascagoula Junior High, since renamed Trent Lott Middle School) to hundreds, yea, verily, thousands of students who all carried the highest regard and utmost respect for this lady. Bessie could not get out, and made only a few excursions from time to time for Doctor visits and the like. Her Women’s Circle (what Presbyterians sometimes call a Bible Study) would meet in her home on rare occasions, as I recall, simply so she could be included. Bessie’s husband had died years earlier, and she lived in this simple little, concrete-block “Navy house” (so called because when the community grew fast during World War II thanks to the ships needed and built for the Navy) with her son Robert. Robert can be the subject of a number of other postings in the future, for the record. A great guy, but with some seeming developmental challenges. But Lord, his mind could hold information. OK, another day. I would stop by and see Bessie from time to time, always calling in advance to make sure it was a good time or day, and always found her mentally alert, in full command of her faculties, but trapped in a body that was worn out and breaking down. Bessie had been in the hospital for a few days, and been released, but not to her home, to an assisted living facility across the street from the hospital. I learned this as I tried to visit her, so after I left the hospital, I went across the street, found out which room she was in, and headed in that direction. As I approached her room, I could hear a conversation that was going on in there, recognizing her voice, and easily hearing that of the person who was addressing her. Bessie was a little hard of hearing, you see, so one had to raise one’s voice. . .
As I turned and eased through the door—of the two-bed room, nodding a greeting to the person in the other bed as I moved toward Bessie in the “bed by the window,” I grasped what was going on. The Occupational Terrorists (ah, ‘scuse me, “Therapists”) were working with Bessie. Apparently Robert had been feeding her, and they were working to get her to feed herself. As I saw Bessie, she was in the hospital bed with one rail up, and the tray in front of her, lunch on it. She was slumped over, listing to starboard (the right), with a fork dangling weakly from her right hand, a small bit of creamed spinach about to fall off it. Her eyes were half open. The guy turned and looked at me, and I simply raised my hands, palms out, and shrugged my shoulders. I saw it coming the minute he said it. “Yes ma’am,” he said, as he slunk away to find some sherbet. Bessie stabbed the spinach into her mouth, chewed and swallowed it, and looked at me. “Yes ma’am,” I said, laughing to myself, thinking that this was going to preach one day at her funeral. And it did. At the graveside, after we’d left the Church with a long string of cars creeping into the cemetery for the interment, the Funeral Director told me that after Bessie’s most famous student, Trent Lott, was elected to the United States Senate, he sent her a speech he had delivered on the floor of the Senate chambers. Bessie marked it up with a red pencil, and sent it back to him. I believe there are. I certainly HOPE there are. And as a theologian with a couple of post-graduate degrees, I think I can say with some degree of confidence, that I am safe in saying so. Here’s my line of logic: God created the world, and all the animals in it. THEN He created humanity, and took a look at whether among all the creatures, there was one that was “fit” to be a helper for the first human. There was not, so along cam woman. But if God created these animals (cats I think, came along after the Fall, by the way), then it is reasonable to believe that God has an affinity for them. And when I read the Revelation to John (the last book in the Christian Bible, and note that it is The Revelation, NOT “Revelations” as it is so often misrepresented), and read about all the creatures that surround the throne of the Lord, I see dogs in my imagination. OK, maybe it is flavored with sentimentality, but still, I think I have a leg to stand on. Tink came into our lives four months after Boston had to be “put down.” We found her at the Jackson County (MS) Animal Shelter, and brought her home. A furry little ball of yellow love, she won our hearts and controlled our lives with her affection. Half Chow, Half Yellow Lab, she became our constant companion. She reminded us that dogs are great examples of unconditional love, that they are the best ways for humans to learn responsibility, grace, forgiveness, devotion, affection, and fidelity. When she was two years old, she dug out of our yard. The next morning, as I walked out to get the morning paper, she trotted up to me with a Black Lab the size of a dump truck. “Oh, Tink, you shameless hussy, what have you done?” I asked, knowing she was in heat. A couple of months later, she produced nine Black Lab pups. We kept one, and named him Gumbo. He is a 90-pound brute that is the biggest sissy you ever met. That’s when Tink taught us about the devotion of a parent. We learned of her defending him from a neighbor’s cat when it tried to swat Gumbo. Then there was the time Gumbo got out, and Tink stayed with him until someone on the other side of town read her collar and called us. Tink, when she was seven, managed the move from the Gulf Coast to metropolitan Atlanta with her usual grace. Show her where her bed was, where the supper dish was, and where the water was, and she was happy. Tink turned 14 back on July 4th, and we celebrated as we always do, with grocery store cupcakes. One bite, swallow, it’s gone. She was slowing down, and started spending more and more time at the door from the Kitchen to the Deck, where she would gaze through the glass to know what we were doing, beg scraps, and fix her brown eyes on us to be let in for “loving,” as we called it. This past Sunday, something was different. She was a doorstop, not getting up, only lifting her head and wagging her tail. The one time she did get up, she walked like she was drunk. Monday morning, Lib and I took her to the vet. It took us both to get her there, as she could not, or would not, get up, and try as I might, picking her up was like picking up a 65-pound sack of jello. Long story short, her heart was constricted by fluid, and there was a fast-growing mass on her heart. We could try to transfer her to another facility, try to drain the fluid, try surgery. The vet emphasized the word “try,” and used the word “critical” several times. Then we all acknowledged her age. “I think we’re there,” I said to Lib. They brought Tink back in, and we got on the floor with her, as medications were administered to sedate her, then to send her on. “Go find Boston, Tink,” I said. Then she stopped breathing. We brought her home, and gave her a dignified final resting place. Our hearts continue to be broken, and Gumbo is really confused, but we are focusing our affection and attention on him, and I hope he’ll be fine. I hope we will ALL be fine. She was my “darlin girl,” as I called her. Will I see her again? I believe so. I believe there are dogs in heaven.